Riparian Rap: Emriver boxes and skilled builders arrive. Emriver boxes and skilled builders arrive. Warren and the talented welder Nick brought us a truckload of Emriver boxes today. These guys don't need publicity, so I'm omitting web-searchable names. Here you see Cara, Jesse, Nick, and Warren. Warren has a big, amazing metals shop in St. Louis that does serious industrial work but also helps less profitable causes (at least by my estimation), including some of our great southern Illinois metals artists, like this guy. 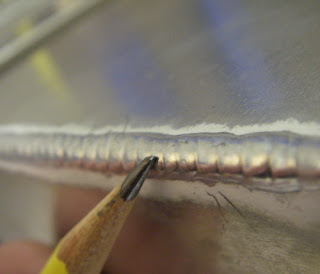 Here's a closeup of an Emriver box corner weld from todays batch. To quote Jesse, "it's textbook." Warren and Nick are talented people--our Emriver boxes are laser cut, even the gunwales, and welded with amazing skill by Nick. I strongly suspect LRRD is given special treatment by Warren because we, like the artists, are doing good work. 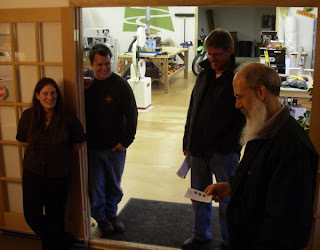 We're also working with Warren and Nick on the Em4 model, and had a great time talking with them about it.